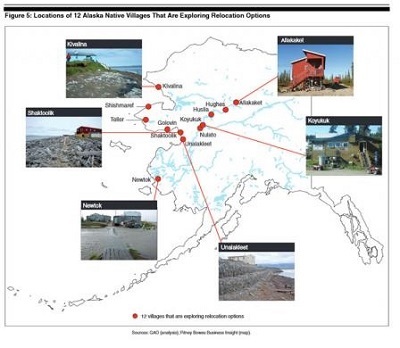 ﻿ Fun Easy English - Environment - Global warming - Climate change Impacts in Alaska. Over the past 60 years, the average temperature across Alaska has increased by approximately 3°F. This increase is more than twice the warming seen in the rest of the United States. Warming in the winter has increased by an average of 6°F and has led to changes in ecosystems, such as earlier breakup of river ice in the spring. As the climate continues to warm, average annual temperatures in Alaska are projected to increase an additional 2 to 4°F by the middle of this century. Precipitation in Alaska is projected to increase during all seasons by the end of this century. Despite increased precipitation, the state is likely to become drier due to greater evaporation caused by warming temperatures and longer growing seasons. 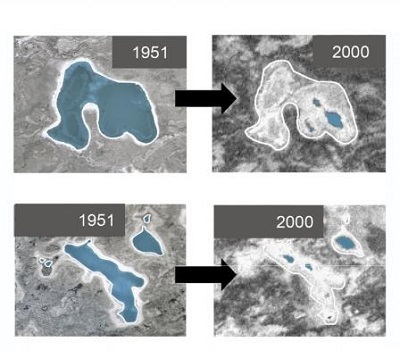 Climate change is causing changes in lakes, ponds, wetlands, plant composition, and wildfires that impact human health, wildlife, and ecosystems. Lakes are changing size, with most lakes shrinking in area in the southern portion of the state. Surface waters and wetlands provide breeding habitat for millions of waterfowl and shorebirds that winter in the lower 48 states. These wetland ecosystems and wildlife resources are also important to Alaska Natives who hunt and fish for food. Higher temperatures and drier conditions increase the risks of drought, wildfire, and insect infestation. 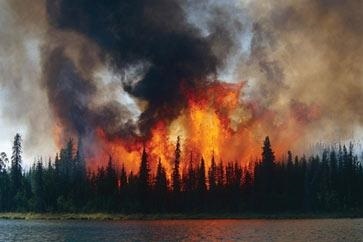 Large wildfires have consumed more boreal forest in Alaska in the last ten years than in any other decade recorded, and the area burned annually is projected to double by 2050. Fires change forest habitat, improving conditions for moose and some plant species, but reducing the lichen that caribou rely on in winter. Warmer temperatures are also expected to worsen insect damage to forests across much of the state, which may increase the area of standing dead, highly flammable trees that are especially vulnerable to wildfire. 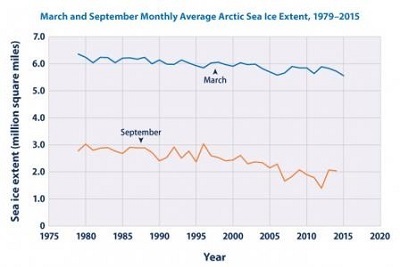 Over the past several decades, perennial sea ice has declined. This decline is, in part, a result of extended periods of above-freezing air or water temperatures. Ocean currents and wind patterns have also played an important role. September 2012 had the lowest sea ice extent (or area of ocean covered by ice) on record, 49 percent below the 1979-2000 average for that month. The September 2014 sea ice extent was nearly 700,000 square miles less than the historical 1979-2000 average for that month - a difference more than twice the size of Texas. The thickness and age of sea ice is also declining throughout the Arctic, with recent measurements indicating a loss of 50% of sea ice since 1979. Climate models project that sea ice will continue to decrease and indicate that the Arctic could be nearly ice free during the late summer by the 2030s. Alaska is home to 229 federally recognized tribes that are already experiencing the impacts of climate change in their everyday lives. Alaska Native peoples depend economically, nutritionally, and culturally on fishing and hunting animals, including polar bears, walruses, seals, caribou, and fish. As the supply of fish and game decline, they are likely to travel onto thinning ice in search of food and are being forced to seek alternative food sources. Arctic plants and animals, including those harvested as subsistence food, are also at higher risk for diseases in a warming climate, further affecting food availability and human health. 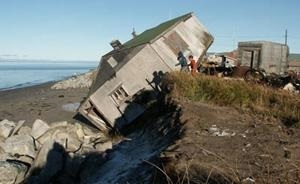 Picture - The ground under a home in Shishmaref, Alaska collapses from erosion. 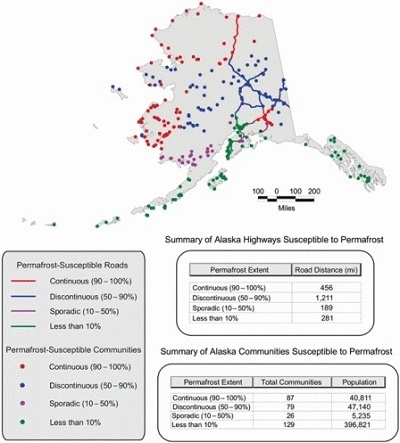 The health of native communities is also threatened by loss of clean water, saltwater intrusion, and sewage contamination from thawing permafrost, as well as by the northward expansion of diseases. Warming also increases exposure to pollutants, such mercury and organic pesticides, that have been transported to Arctic regions and are released from thawing soils.